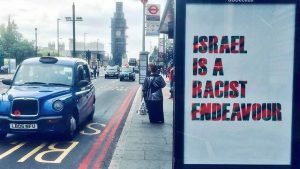 Bus stops across London were defaced with posters in the colors of the PLO flag declaring “Israel is a racist endeavor.” Apparently, these unauthorized ads protest the British Labor Party’s decision to adopt the definition for anti-Semitism by the International Organization for Holocaust Remembrance. Without the guidance of a teacher who is a Kabbalist, it is impossible to understand the secret that is latent in the Torah, in the Mishnah, or in The Book of Zohar. Since the destruction of the Temple, there has been controversy about the concept of “Lishma” over the question of whether the Torah requires a correction of the ego in order to love. Torah “Lishma” means that I perform actions for the sake of others, “Lo Lishma” (not for Her Name) means that I am doing things for myself, for the sake of receiving a reward, respect, and so forth. Most people lost the connection with Torah Lishma and the Kabbalists who taught this were always oppressed and persecuted. 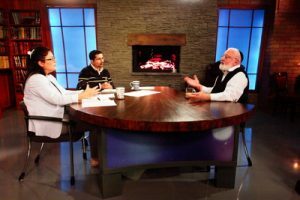 The language of the branches, which Kabbalists teach, is based upon the connection that exists between the upper force and the physical branch that is activated in our world. People who claim that there is no need to maintain the Torah Lishma, the correction of the ego and loving, are dealing with the externalities of the Torah; while the Kabbalists learn it through the language of the branches, and discover its upper spiritual roots. Why do I get punished for thoughts and actions if they aren’t mine? There’s no punishment or reward in the world, there’s learning. One is taught to reveal the Creator’s singularity. This is the aim of our development. If I can connect to others in order to fulfill them, to this extent I find contact with the upper one, as if a valve opens and my soul gets filled to the extent I transmit upper light to the others. When I transmit all of this, an illumination, Or Hassadim, remains in my soul.